An automatic set-up, dedicated to seed selection, was designed and build. 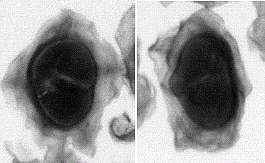 X-rays are used for the selection of sound mono-germs. 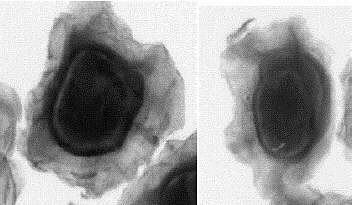 A specific high resolution radioscopic imaging system (pixel size 20 µm) is described. Summation of five successive images allows a very good signal to noise ratio. Thus a rate of one image per second can be considered, including the mechanical translation of the conveyor. Four to six seeds can be set on the same image, according to the size of the camera and to the processing conditions, thus allowing a rate in the range 15,000 – 20,000 seeds per hour. The system presented here uses a thin fluorescent screen coupled to a CCD camera; it is specially designed to perform images at a very low photon energy, corresponding to a 20kVp potential. The whole acquisition chain is presented, from the design of the acquisition set-up to the development of specific image processing algorithms. Present agricultural techniques rely on a high confidence level. The idea is to automatically plant one seed at each spot, in the field. To optimise the plant production yield, each seed must therefore have one healthy germ, and only one. Otherwise, there might be at some locations no or several degenerated plants, that could not be harvested. 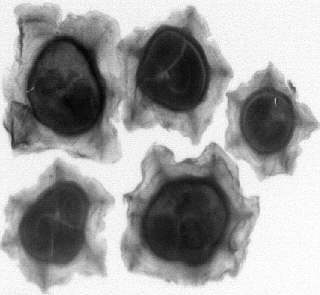 We develop, in this paper, an original process based on X-ray imaging to perform such a selection. As regards the automation of the seeds selection, specific patterns recognition techniques are presented. For such complex-shape materials, we cannot rely on the conveyor to guaranty the reproducibility of seeds poses. To take into account for the broad variety of genetic types (mainly twins, empty seeds and bi-germs) as well as the variety of shapes and poses, we define a complete set of features to be extracted. They combine contour and area analysis with dynamic programming algorithms. Feasibility and relevance of the proposed testing process is illustrated on a representative range of a few hundred seeds of different genetic types and poses. The automatic selection is compared to the expert decision. At the present time, mechanical sorting machines are currently tuned to select seeds, according to their weight and shape: empty seeds, for instance, are thus easily discarded. However, there still remain seeds of different types like multi-seeds, twins, or seeds with degenerated germs (occupying only part of the shell). Manual radiography on X-ray sensitive paper is usually performed, offering a reasonable spatial resolution but a very low rate (1200 seeds per hour) and needing a full-time human operator. Radioscopic set-ups exist : one simple solution is to use a micro-focus X-ray tube, in such a way to deliver an enlarged view of the small seeds (3.5 to 4.5 mm). Due to the bad environmental conditions (dust, temperature variations), such a solution is definitely not the best, due to the low reliability of micro-focus in an industrial environment. Seeds are rather small objects, as mentioned above, thus presenting a very low value of photon attenuation. The standard energy range (high voltage between 100 and 200 kVp), used for current X-ray radioscopy, cannot be used in this case of very small and light object. 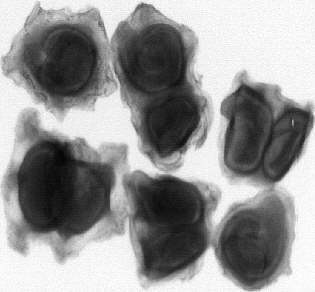 For instance, the regular radiographic conditions for seeds, using sensitive paper, require high voltage conditions down to 15 kVp, in such a way to enhance the very poor image contrast. Using now real-time cameras, the low sensitivity of these devices is usually not sufficient in that energy range, involving the recourse to a higher potential and therefore a loss of image contrast. We thus developed a specific imaging device suited for low voltages applications and high spatial resolution. For this kind of image, a voltage of 20 kVp, as compared to the 15 kVp traditionnal value, is a good compromise, offering an image contrast which is just a bit lower, related to an higher X-ray flux, sufficient for a real time application. 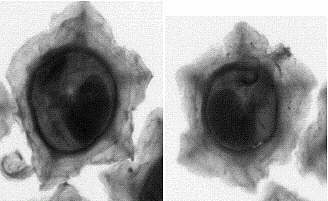 The use of a mini-focus X-ray tube (0.6 mm spot size) allows a reasonably high X-ray flux (around 20 time the flux delivered by a microfocus). Moreover such a tube, designed for industrial applications, will offer a far better reliability than a micro-focus, which must be rather considered as a laboratory equipment. A sealed mini-focus X–ray tube was selected, allowing a current up to 10 mA when operated at 20 kVp. Highly stabilised mode of operation ensure relative voltage and current fluctuations down to 10-3. The low focus size, 0.6 mm, allows the fluorescent screen, to be set at 13 cm only of the focal spot with an acceptable value of the geometrical unsharpness, the conveyor being located as close as possible of the screen (typically 5 mm). Image blurring does not exceed the size of the expected resolution. Spatial resolution is also determined by the nature and thickness of the fluorescent screen. A layer of “gadox”, i.e. 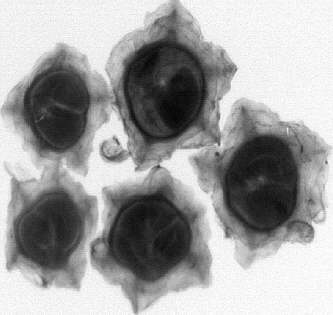 gadolinium oxy-sulphide, terbium doped (Gd2O2S:Tb), 10 µm thick, set on a glass slide, was designed and ordered. The high values of density and atomic number of this compound involve a strong attenuation of X-rays and therefore a bright image, in the range of green light (wavelength = 550 nm). The choice of glass as mechanical support (instead of aluminium) allows the fluorescent layer to be set directly on the side facing the X-ray tube, the camera being focused on the fluorescent layer through the glass slide. X-ray photons coming from the tube are therefore impinging directly on the screen, without any attenuation. Such a precaution, made necessary by the extremely low energy of the selected photons (< 20 keV), furthermore intensify the brightness of the scene, thus contributing to the high final value of the signal-to-noise ratio. Summation of five successive images is therefore sufficient, lasting around 200 ms. Thus a rate of one image per second can be considered, including the mechanical translation of the conveyor. Prevention of light reflections inside the glass slide is ensured by deposition of an anti- reflection multi-layer coating. The selected CCD camera, equipped with a 756x 576 chip, 11 µm x 11 µm pixel size, is read through a standard CCIR (652 lines ; 25 images per second) process. Focusing on the screen is ensured by a “tandem” optic designed to deliver images with a 20 µm pitch; a mirror is used to set the chip apart from the photon flux. In this arrangement, four seeds can be set on the same image. Acquiring and processing one image per second will allow to test 15,000 seeds per hour. The conveying of seeds just in front of the fluorescent screen is enabled by a polycarbonate disk drilled with holes (one seed per hole), arranged along a regular pattern. A cover, made of a thin Mylar sheet, in such a way to minimise X-rays attenuation, allows the seed to pass at a few millimetres in front of the screen. The disk rotates to drive a new set of seeds in front of the camera, and stops during image summation. A surrounding box, comprising a long and narrow entrance and overlaid with lead, ensures protection against X-rays and prevent visible light to fall on the screen. Setting the seeds in the holes is assumed just outside the box; using a secondary rotating disk on which the seeds are fixed by sucking air through a netting of fine drills. The sucking process is stopped at the right moment and the seed falls into its receptacle, on the main disk. When the seeds have passed the testing stage, a sucking process allows them to fall into different baskets. As already mentioned, the aim is to automatically sort the good seeds, i.e. having only one healthy germ, from the bad ones. The proposed algorithm is hierarchical, as some tests are specific to monoseeds and some to biseeds. For an introduction on image processing principles, refer to reference books such as Gonzales & Wintz (6), Rosenfeld & Kak (9) and Horn (8). Fig 1: A healthy monoseed composed of a collar (light intensity), a shell (dark ridge) and a germ (bean-like shape). For the seed type we have to deal with, the germ is enclosed in a shell, surrounded by a collar. This collar does not bring any useful information as regards its shape and is rather annoying for seed recognition issues. To isolate the shell and the germ, we designed a routine based on the intensity histogram to suppress the collar surrounding the seeds. A typical seed is depicted in figure 1. An initial entropy thresholding (10) based on the global intensity histogram of the flat- fielded image enables to dispose of the seed collar whose intensity is globally lighter than the germ. The intensity histogram (see figure 2) clearly shows this bimodality. This clipping step automatically adapts to the acquisition settings and does not require any a priori reference level. A subsequent morphological close (11) fills the remaining isolated holes in the germ that have been clipped by the entropy thresholding. Fig 2: Typical intensity histogram of a seed X-ray image. The discrimination of biseeds from monoseeds by means of pattern recognition techniques is not trivial as their apparent outer shape might be quite similar. Moreover in the biseed type, seeds can be attached to each other by any part of their shell, which induces a large variability in the biseed aspect. The variability of the seed shape is illustrated in figure 3. Fig 3: Seed shape variability: two monoseeds beside four biseeds. Classic measures like circularity or compacity appeared to be not sufficiently discriminating after a statistical study. Seed concavity is the most reliable primitive. But the concavity variability being rather large, we propose a measure based on the ratio of the half width of the minimum bounded rectangle to the closest distance between the outer shape and the gravity centre. Around 89% correct seed shape discrimination is achieved by this measure (see the results section). The distinction of twins in the monoseed type is the most difficult task. Twin germs may be characterised by the border in-between. However, this border may be not planar and even wrongly oriented with respect to the acquisition. As a result, the aspect of the border between twin germs varies a lot. Five twin germ monoseeds are shown in figure 4. Fig 4: Examples of twin germ monoseeds. Watershed-based (11) methods are too sensitive to the quality of the twin border, which may be of quite low contrast in some cases. Hough transform (2), applied with line extraction, cannot cope with highly curved twin borders, and miss to detect most twins in our experiments. Standard high-pass filters (Canny-Deriche, zero-crossing of the Laplacian...) fail to recover any continuous border, and even worse, cannot give any discriminating output (heavily surrounded by noise). A more constrained technique is required. We propose to use an optimal path tracking algorithm. The drawback here is that we do not and cannot a priori know where the path extremities of the twin border are located on the seed shell. The proposed method is based on dynamic programming techniques, historically solved by Dijstra (5), and recently updated in the level-set framework by Cohen with the so-called fast-marching algorithm in 2D (3) and 3D (4). Given a cost criterion and a causality on a graph, the idea is to recover the global optimal path. We applied this technique to determine the eventual presence of the twin border line in the monoseed. The main part of the cost criterion is the intensity difference between the highest intensity value in the seed and the current one on the path. The distance to the mass center is also taken into account to avoid paths close to the shell, a high intensity line being present at the germ periphery (see figure 1). The optimal path is sought for 8 different orientations of the seed (every 22.5 degrees). This best estimate of the twin border is then used to derive a discrimination measure between single and twin germs based on the sum of the oriented Laplacian normal to the optimal path. To finally determine the viability of a seed, the shell-filling is assessed, i.e. the percentage of seed germ area with respect to the whole seed area. An entropy thresholding is applied inside the shell to estimate the relative proportion in size of the germ. Figure 5 shows three degenerated seeds beside two healthy. Fig 5: Examples of single germ monoseeds: two healthy beside three degenerated. The seed population consists of 138 seeds composed of 90 monoseeds and 48 biseeds. The seed expert decision was 52 valid, 64 non-valid and 22 doubtful seeds. The automatic shape discrimination method achieved a success rate of 89% of correct classification of biseeds from monoseeds. Failures were due to a particular pose of the biseeds when both seeds superimpose. Figure 6 illustrates this particular case. They were deliberately placed in such a pose, even though unlikely encountered in reality. Putting aside these cases, we obtained close to 100% correct classification as regards the shape type. Fig 6: Biseeds: correctly discriminated (on the left), and failed (on the right). The case where both seeds superimpose (right image) is quite seldom in practical cases. Among monoseeds, the discrimination of healthy germs from twins and half empty seeds reached 74%. The somehow low discrimination rate of the automatic pattern recognition method is mainly due to the large variability within the monoseed type. Let us illustrate this variability for each seed type with two examples, one where the proposed classification methods correctly succeeds, one where it fails to discriminate the healthy seeds. Note that each picture is inserted with the same magnification ratio in figure 6 to 9. Most failures come from cases that are very unlikely. The proposed method to discriminate twin germs from single germ seeds becomes inappropriate when the separation border between the seeds is not tangent to the acquisition direction. Figure 9 depicts such a case. Fig 7: Healthy monoseeds: correctly detected (on the left), and mistaken for a degenerated (on the right). Fig 8: Degenerated seeds: correctly detected (on the left), and failed (on the right). Fig 9: Twin germ seeds: correctly detected (on the left), and failed (on the right). The pattern recognition techniques, presented in this section, have been developed off-line during the feasibility phase of the seed sorting. It has been recently transferred to the computer that drives the non destructive testing X-ray equipment that has been assembled. As the image processing method was tuned in the laboratory on a test equipment bench, a deeper statistical study should now be performed at the industrial site on the assembled equipment to optimise the system parameters on a much wider seed set. We presented in this communication a non destructive testing application, specifically designed for low voltages radioscopic imaging with high spatial resolution. We showed that in the general case standard NDT equipment, currently available, may not match all industrial specifications of the application that has to be dealt with. Dedicated NDT design must be definitely carried out in most industrial cases. Such an design process has been presented in this paper and successfully applied to the food industry concerning an automatic seed recognition and sorting problem. The whole acquisition chain has been considered and optimised according to the application specificity: from the design of the detector, the choice of the x-ray generator, to the development of dedicated image processing routines. F. Attix, W. Roesch (Eds. ), Radiation dosimetry, Vol. 1, Academic Press, 1968. D.H. Ballard, "Generalising the Hough transform to detect arbitrary shapes", Pattern Recognition, 13(2), pp.111-122, 1981. L. Cohen, R. Kimmel, "Global minimum for active contour models: A minimal path approach", International Journal of Computer Vision, Vol.24(1), pp.57-78, 1997. T. Deschamps, L. Cohen, "Fast extraction of minimal paths in 3D images and applications to virtual endoscopy", Medical Image Analysis, Vol.5, pp.281-299, 2001. E.W. Dijkstra, "A note on two problems in connection with graphs', Numerische Mathematic, Vol.1, pp.269-271, 1959. R. Gonzales, P. Wintz, Digital Image Processing, Addison-Wesley, 1977. R. Halmshaw, Industrial Radiology - Theory and practise, Chapman & Hall, 1995. B. Horn, Robot Vision, MIT Press, 1986. A. Rosenfeld, A. Kak, Digital Picture Processing, Academic Press, 1982. P. Sahoo, S. Soltani, A. Wong, Y. Chen, "A survey of the thresholding techniques", Computer Vision Graphics and Image Processing, Vol.41, pp.233-260, 1988. J. Serra, Image analysis and mathematical morphology, Academic Press, 1982.